Do you listen to Sufjan Stevens? He ripped much of his arrangement style directly from Steve Reich. Ouch. Ripped? That sounds a tad harsh. Yes, I deeply enjoy and admire Sufjan's work. Seen him live a few times--wish I could say the same for Reich's music. Oh, I apologize. Ripped is a bit harsh. I love Sufjan's work, I think his great contribution to music is how he combined the inherent minimalism of folk music with the minimalist work of people like Steve Reich. 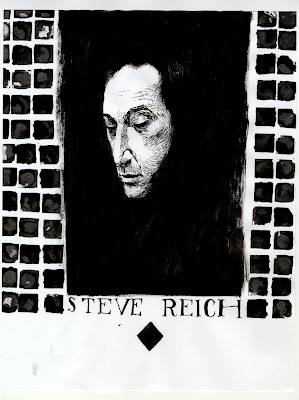 I haven't heard as much of Steve Reich as I'd like, I just know that much of what we think of as "Sufjan's unique sound", has its root in Steve Reich's music. I've yet to see Sufjan in concert (much to my chagrin), I've heard he's fantastic. Yes, I was introduced to Reich after hearing Sufjan, and his influence is clear and wonderful. Seeing a Sufjan show is definitely worth a multi-hour drive. And definitely make it a point to get some Reich records. Worth every penny and then some. In Sufjan's "Year of the Rat" from Enjoy your Rabbit, he seems to be using a sample from Steve Reich's "Phase Patterns" - but I could be wrong.